The official study guide for the entry-level Oracle Certified Associate exam for Java Programmers-fully updated for Java SE 8Confidently prepare for the OCA Java SE 8 Programmer I exam with this thoroughly revised, up-to-date guide from Oracle Press. Featuring step-by-step exercises, comprehensive chapter self-tests, and a CD-ROM containing two complete practice exams, this volume provides an integrated, easy-to-follow study system based on a proven methodology. 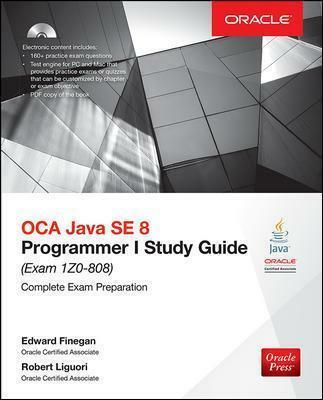 OCA Java SE 8 Programmer I Study Guide (Exam 1Z0-808) offers the most complete and in-depth coverage of all of the exam objectives, and also serves as an essential on-the-job reference for Java developers. You'll have access to a total of more than 250 challenging practice questions that precisely mirror the content of the live exam-no other guide on the market provides the same level of accuracy and detail. Edward G. Finegan is a Senior Java Software Developer and is currently working in the casino industry developing gaming software. He has past experience in aerospace radar data commutation and artificial intelligence, specifically machine learning algorithms. Mr. Finegan has a Bachelors degree in Computer Science from Rowan University, and a Masters degree in Computer Science from Virgina Commonwealth University. He is a Sun Certified Java Professional. Robert Liguori is a Senior Software Engineer and has been developing, maintaining and testing air traffic management systems since 1996. He is currently the lead developer for several Java based air traffic management applications. Mr. Liguori has a Bachelors degree in Computer Science and Information Technology from Richard Stockton College of New Jersey and is a Sun Certified Java Professional. Mr. Liguori is also the President of the Atlantic City Java User Group.